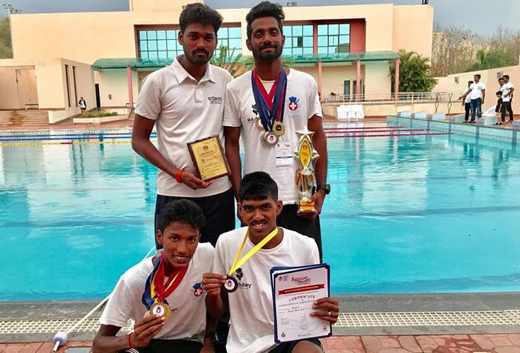 Mangaluru, June 13, 2018: The Puttur Aquatic Club swimmers grabbed 14 medals in the Rescue Skills Competition 2018, conducted by Rashtriya Lifesaving Society (India) at IIM, Indore. This National Lifesaving Competition is a platform for swimmers and RLSS athletes to showcase their rescue skills, aquatic agility, and strength. This competition consists of several obstacles and endurance races in the pool. It showcases the swimmer’s rescue skill and alertness. Sweekrith Anand from Puttur Aquatic Club won the Individual Championship in Masters’ Category by winning 7 medals and scoring 21 points. He won 2 golds in 50 metres Mankin Carry and 100 metres Rescue Medley; four silver medals in 100 metres Obstacle Swim, 100 metres Mankin tow with fins, 12 metres line throw and in 200 metres Super Life Saver. He also won a bronze in 200 metres Obstacle swim. Trishul Gowda, a 2nd PU commerce student from St Philomena College, Puttur, won five medals. He won two gold medals in Super Lifesaver and in 4x25 Manikin carry relay, two silver in 200 Obstacle swim and in 100 metres Manikin Carry and one bronze medal in 50 metres Manikin carry. Roysten Rodrigues, a 2nd PU student from St Philomena College, Puttur, won one bronze medal in 200 metres Obstacle swim. Umesh Mahabala won one silver in Line throw and one Bronze medal in 100 metres Mankin tow with fins. Rohit was their team manager who guided and coordinated with the PAC team. All of them train at Balawana Swimming Pool, Puttur, and train under coach Partha Varanashi and coach Niroop G.R.